I'm still not myself today... Perhaps I should have been praying for creativity in church this morning, rather than drawing during the sermon. You know, even on your worst days your stuff turns out great. I know what you mean though. I haven't liked what I having been doing today. Doing the scavenger hunt on WC and just working through it. Took me through the 4 sketch before I had something I liked. I truly like your restaurants and street scenes. Remember the journey is what is important and enjoy what you are doing. Oh Suzanne, you and I are guilty for the same thing, I have lots of these types of sketches too! Yours are much better than mine though. My husband rolls his eyes at me everytime he looks over to see me sketching Ethels new bee hive hair do or someone trying to sleep while trying to look attentive. I now try to sketch and journal so as I am absorbing things visually, my mind is being bathed in scripture too. Between both of those things I have hope that it sinks in even deeper! Kindred spirits we are. Thank you so much for your kind thoughts. It is interesting how much easier things flow when you are in the right mindset. 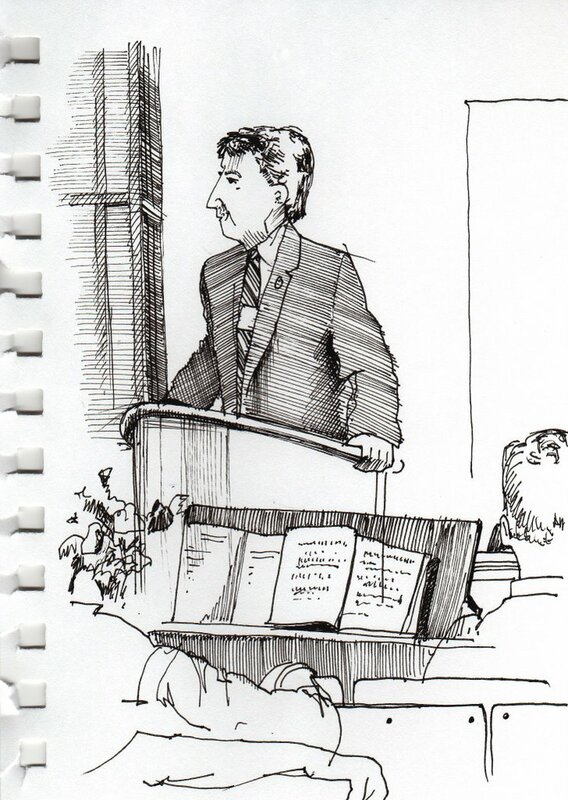 Great sketch - I take my sketchbook to church too! 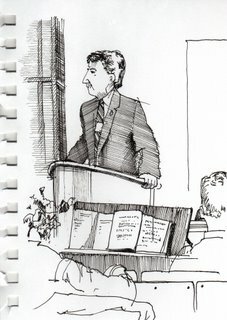 I love to journal and sketch during worship services. I often find that God speaks in peculiar and profound ways through what I end up with on my page.